The first major dose of severe culture shock hit me when we arrived, after nine long hours of miserable travel, at our destination, Bhulbule. It was already getting dark so our guide Hari had to find the first teahouse available. Teahouses are pretty much the only accommodations available in most of the remote villages throughout Nepal. They are extremely basic, usually having a traditional kitchen on the first floor (where the family lives) that has a wood-burning stove, and very basic, small rooms one or two stories above the common area. Each room typically has a wooden bed with a thin mat and no blankets (hence need to pack your own sleeping bag). If you are lucky you will have a small table or an extra chair to put your belongings on, and sometimes electricity but it is sparse. The communal bathroom was the biggest shock of all. I knew they would be bad but was not prepared or expecting to discover how bad the bathroom situation really was. At the teahouse all toilets were located down the hall, in a dark, smelly room with two foot pads and a hole. A bucket of water and a trash can were located adjacent to the toilet. After such a long, terrible day, my first sight of the toilet made me gasp in horror. I’d been to places in Europe with the squat toilets but it wasn’t that frequent. I began to worry how on earth I would survive twelve long days trekking and staying in the teahouses without my beloved, clean western toilet. To make matters worse, there was no running water to wash your hands, no toilet paper, and the communal shower was ice cold and just as basic as the toilet. 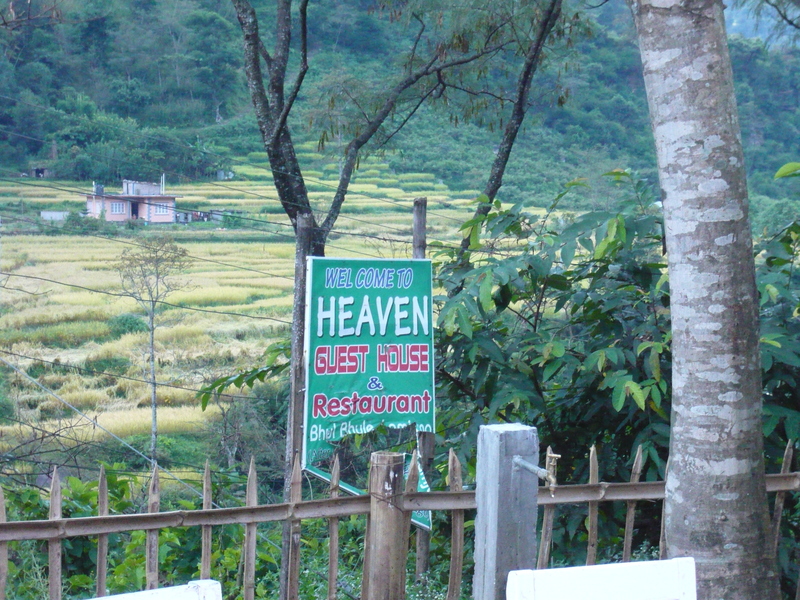 Ironically enough, our teahouse was called “The Heaven Guest House” but there definitely wasn’t anything the least bit heavenly about it. I found the name to be so ironic that it made me laugh despite myself. 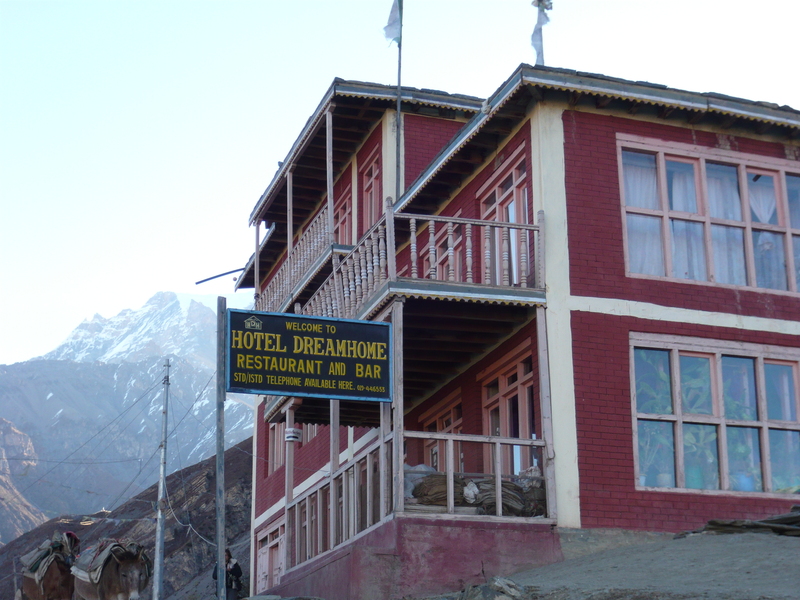 As I would later discover, almost all the teahouses along the trek had such hilariously, similar names such as The Paradise Inn, Hotel Dreamhouse, and The Shangri-La. The owners of the guesthouse were nice and friendly and the food was edible but the culture shock that first night was unbearable. Of course I’ve experienced it many times before. Usually the first day or two in a new country, culture shock is a common, normal experience. It takes a few days to get used to the new culture and either accept it or reject it. But this time, the culture shock was severe and it was a terrible feeling. I wanted desperately to go home but was ashamed to admit it, especially to my dad. I wondered why on earth I’d ever decided to go to Nepal and wish I could click my magic shoes together and instantly arrive at home, just like Dorothy. As I climbed into my hot, sticky sleeping bag that night, I closed my eyes and prayed tomorrow would be a better day. We didn’t stay here but I couldn’t resist taking a picture of it!